Today's breakfast is a pretty dish. 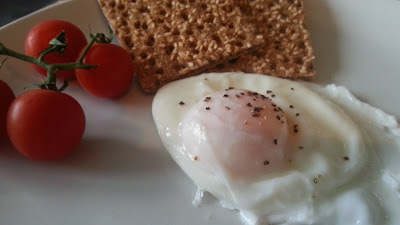 Poached egg, cherry tomatoes and Ryvita. I've heard different stories how to cook a poached egg and have had many disasters in the past. Some people say add salt to the water, others (my mum) insist vinegar (the white kind) is necessary, although she can't explain why. I used neither. All I did was bring the water to the boil, swirl it with a wooden spoon and crack the egg in. The swirling water keeps the egg in shape. Guess what? It turned out perfect! Another successful breakfast. And a healthy one to boot.